By far one of my favorite cookies is the Oreo. I may even dare to say that it is my favorite. Those chocolate wafers combined with a layer of white cream are just oh so delicious. I am a traditionalist and do prefer just classic Oreo Cookies over any other varieties. From time to time though, I like to go out on a ledge and mix it up. Perhaps it is Golden Oreo’s or Peanut Butter Oreos – whatever it is, I know they will still be great. A few months ago, I tried Mint Oreos for the first time and since then, these have become second only to the originals. Oreo’s are almost $4 a package so I only buy them when Publix has them on sale. I originally started to purchase the Mint Oreo’s for Taylor and didn’t try them right away. But boy oh boy, once I tried them, I was sold. On first look, the Mint Oreo’s appear just like any other Oreos – two chocolate wafers and a layer of cream on the inside. 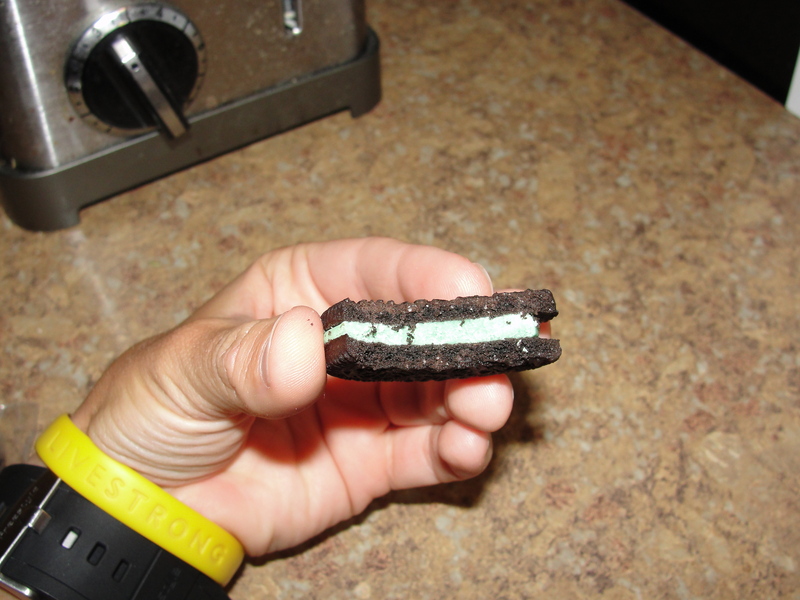 Of course, these Oreo’s are not only rocking a layer of cream but, the layer of cream is Mint. I do not see any where on the packaging stating that the Oreo is a Double Stuf but, the amount of cream inside leads me to believe it is. Since these Oreo’s are just about the size of a Double Stuf, I prefer to break the cookie in half and eat one half at a time. As I bite into the cookie, I first taste the familiar taste and crunchiness of the chocolate wafer. The wafer is crispy inside out yet is very easy to chew. The flavor of chocolate is very relevant and there is no question in my mind that I am eating a chocolate wafer. For me, the best part of the Oreo is the chocolate wafer so I thoroughly enjoy every bite of them. 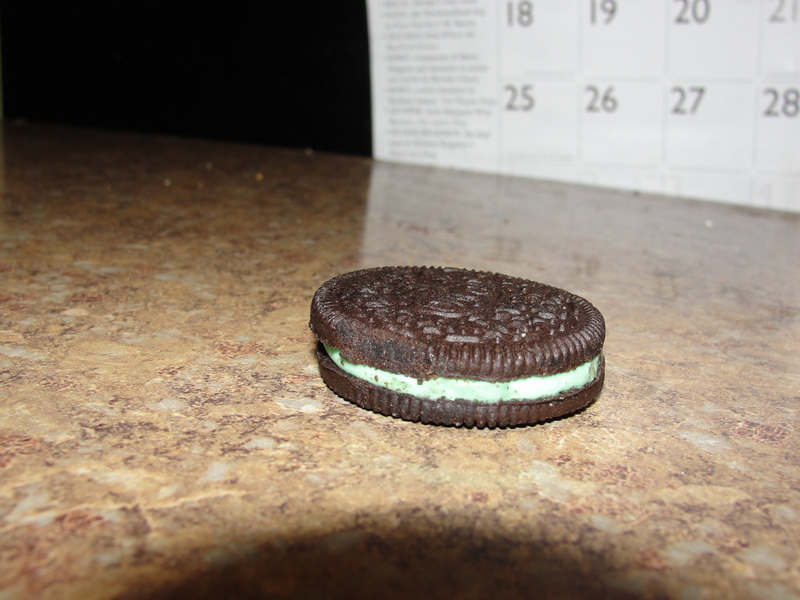 The center of these Mint Oreo’s is pretty rocking. The cream is surely mint and it plays so well with the chocolate wafers. Neither flavor is lost in the eating process. The mint is creamy, smooth and perfectly flavored. My mouth is left with a refreshed feeling after eating the Oreo. Even as I chew the Oreo, I can taste the cool, icy flavor of the mint – a new sense-sensation over the regular Oreo. The mintiness of the Oreo is enhanced when these Oreo’s come right out of the fridge. It seems as if the amount of mint flavor gets bumped up which makes the end product even better. Also, the time in the fridge gives the chocolate wafers another element as well. 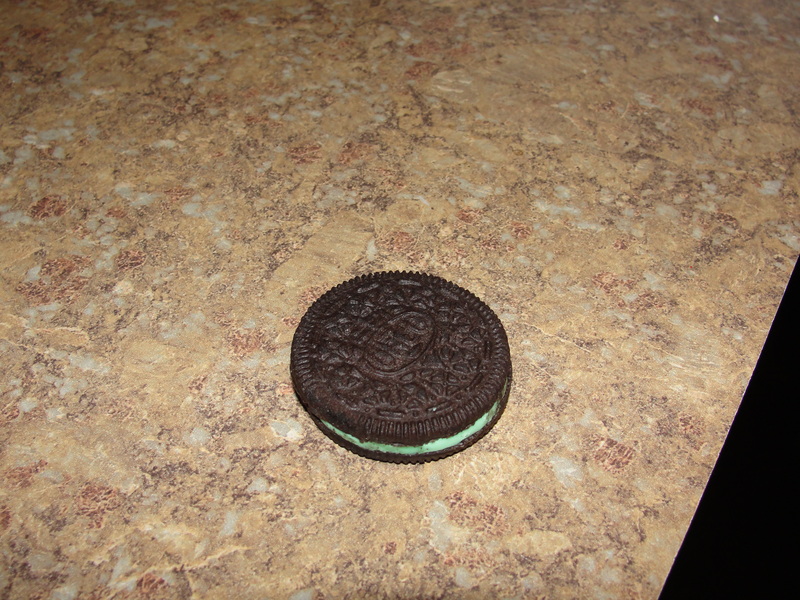 In the end, the Mint Oreo right out of the fridge is tastier & mintier then the room temperature Mint Oreo. I so prefer regular Oreo’s at room temperature but, I think I can say that I prefer the Mint Oreo right out of the fridge. Oreo’s may be my favorite cookie but I don’t buy them nearly as much as I would like to. 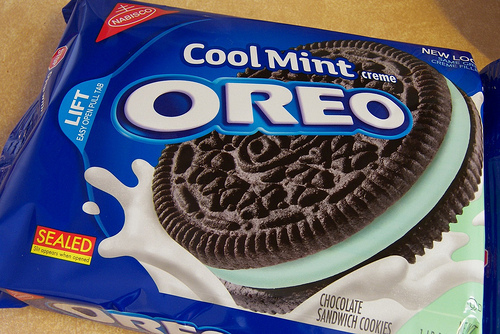 I am glad that I have found the Mint Oreo’s and can add them to my occasional purchasing of the classic cookie. The Mint Oreo takes the classic Oreo taste we know and love so much, to a new sense-sensation level. The replacement of mint cream for the vanilla cream, gives this Oreo a new taste that is so simple yet so delicious. While eating these Oreos, I ride a Mint Storm in My Mouth and come out fully refreshed.